A few years ago, we were all in Maine for my sisters wedding. The next morning everyone gathered at my sisters house, as many of us were traveling home that day. The kids were playing outside and the adults were in the kitchen looking for coffee. Then the kids were all saying how hungry they were. My sister Erica and I looked at each other like “ummmm there are a lot of kids here” ...but then decided to make pancakes. We looked around and found some chocolate chips, and some fresh strawberries. We proceeded to make the pancake batter, and then I came to the realization that my sister did not have a griddle. As we were gathering a bunch of skillets, I pulled out a muffin pan. (DING DING DING!) I said "Let's just put them in the muffin pan!" Great idea! Low and behold- they came out perfect. My sister and I now make pancake muffins on a regular basis. The kids love pancake muffins, and dipping them in syrup is even more fun! 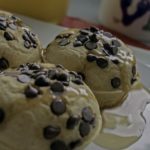 Simple, fun, and mouth popping pancake muffins will have your kids enjoying breakfast again! These pancake muffins are made with natural ingredients, so your kids (and yourself!) will be full and satisfied all morning. 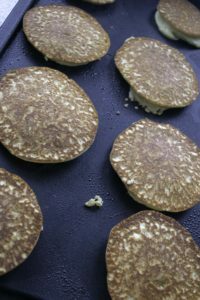 The recipe is so versatile, you can add any of your favorite ingredients such as berries, banana or chocolate chips. Spray muffin tins lightly with cooking spray. Add eggs, egg white, coconut oil, water, honey, and vanilla extract to a blender. Blend until frothy, about 20-30 seconds. Add the remainder of the ingredients and blend until blended, about 1 minute. Add the batter to the muffin tins. 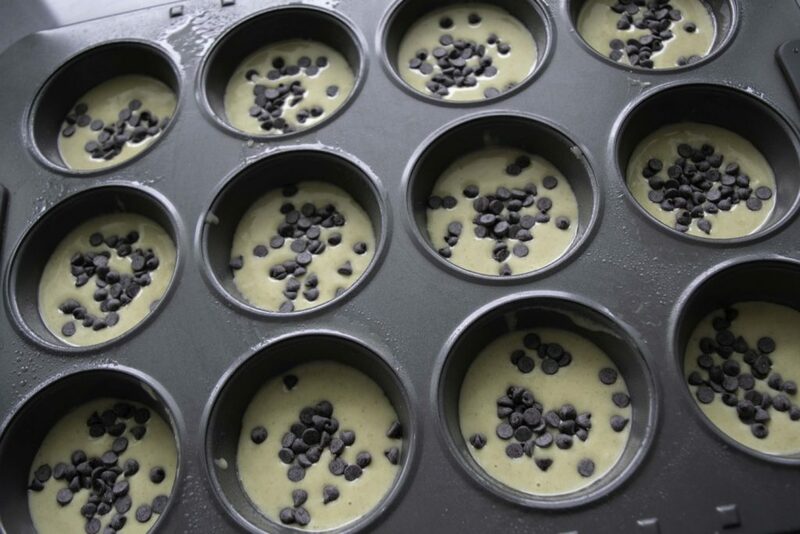 Evenly divide the mini chocolate chips to the top of the pancake muffin batter. Bake for 10 minutes, until fluffy and golden brown. You can substitute the chocolate chips for any fresh or frozen fruit as well. These pancake muffins freeze well! Just put them in a freezer ziplock bag and thaw them out as needed. The same batter can also be used to make regular griddle pancakes.